What role does Islamophobia play in terror attacks? Days after the deadly Brussels attacks, which killed 32 people at the city's airport and a metro station, right-wing demonstrators appeared at a memorial to denounce the country's Muslim community. A week later, police had to intervene when similar right-wing protesters squared off against anti-racism demonstrators. The confrontations underscore an important, though perhaps uncomfortable, question: to what extent does Islamophobia contribute to the atmosphere of isolation that breeds violent radicals? "When you have no life objectives, no long-term objectives, you try to find your quest for self elsewhere," explains Tewfik Sahih, a lifelong resident of Schaerbeek, Brussels, the neighborhood in which the bombs used in the Paris and Brussels attacks were made. "Many people feel discriminated [against] here. Some citizens here don't feel part of the national community." Experts tell CBSN that many of Belgium's disenfranchised Muslims feel more loyalty to their nuclear communities than their country. So, even if they don't necessarily agree with how certain members of their neighborhood or mosque choose to lash out, they might not be inclined to report those people to the authorities either. "The mafia protects itself. Hooligans with soccer clubs don't betray themselves as well. It's very much a group mentality where you don't betray," explains Michael Privot, director of the European Network Against Racism. "The Muslim community feels really under siege. They are victims themselves of hate crimes. So, if you want to really help them make the change from within ... you have to give them breathing space ... open space for them to build a future." As it currently stands, most Moroccan and Turkish immigrants live in what is known as the "poor croissant" of Brussels. And the conditions in those neighborhoods offer little hope for social or economic success. "In Molenbeek, one young person of Moroccan background out of two is unemployed. One family of Moroccan origin [out of two] is below the poverty line. You see, it's dire," says Privot. "Schools are ghettoized. ... You have a whole generation of youngsters, aged 15 to 25, that have no skills because they didn't receive proper support. Not from parents and not from the state. Those young guys are living in Brussels, which is one of the most competitive cities [in the world], but without skills to find a job in their own city." The actions of the few then spawn a vicious cycle for the many, according to Privot. The societal factors that contributed to the radicalization of the Brussels and Paris attackers are heightened by the fact that they executed attacks. Discrimination against Muslims in neighborhoods like Molenbeek and Schaerbeek worsens. It becomes even harder for members of those struggling communities to find jobs. And perhaps worst of all, it excludes them even further from the Belgian mainstream. "There is an increase in polarization within the majority community, and a sense of exasperation towards Muslims," Privot said in the aftermath of the March 22 attacks on a Brussels airport and metro station. "This is really in the mainstream. It's the man and woman on the street who decides to take justice in their hands and insult someone. ... A few months back, people would not resort to insults. Now, people do resort to racists slurs. You really see and feel the tensions within the society. So, this is one more nail in the coffin of social cohesion." 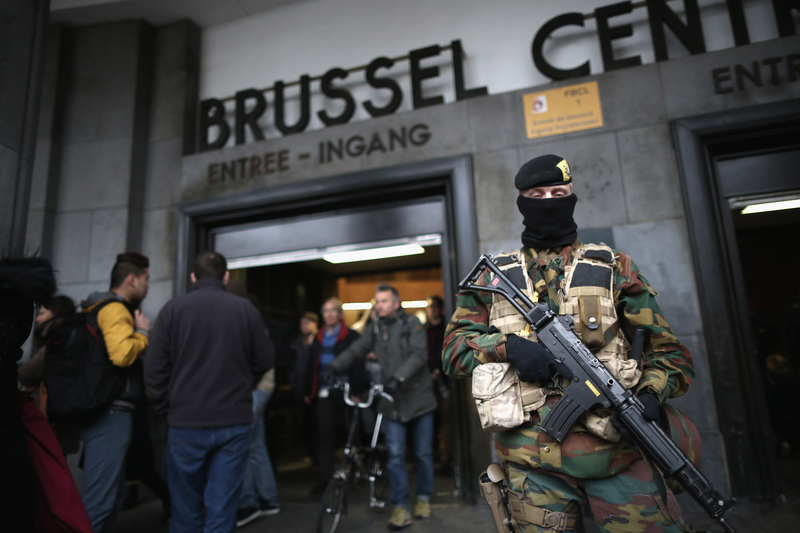 "Terror in Brussels: Hiding In Plain Sight" airs on CBSN at 8 PM ET on Monday April 11.